Polyelectrolytes are water soluble polymers carrying ionic charge along the polymer chain. Depending upon the charge, these polymers are anionic or cationic. Polyelectrolytes are available in a wide range of molecular weights and charge densities. Homo polymers of acrylamide are also included in the family of polyelectrolytes though they do not carry any charge. 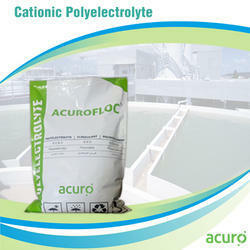 ACURO's range of Polyelectrolyte products contain affinity radical and they can dissolve in water easily and play the role of flocculation, filtering-assist, increasing adherence, reducing resistance, coherence, reinforcing and rheologic regulation and can be used extensively. Flocculation property can be used for recovering solid substance, treating various industrial sewage, domestic sewage and purifying water, assisting filtering, treatment of tail coal as well as well-drilling slurry material etc. With the rheologic regulation function polyelectrolyte can thicken water, recover driving agent for oil field to reform ground section, enhance adoption ratio. It can make up fracturing solution to fracture the stratum which is difficult to drill and it also can make up well-drilling solution which can reduce friction and resistance, accelerate drilling speed, improve drilling depth. With the property of adherence and reinforcing of PAM, it can be used for paper-making industry to enhance staying rate of filling material, speed size filterability and white water sediment in the paper and then coagulate to increase the strength of the paper. PAM can be used with polyvinyl alcohol as textile size, this can improve textile process and enhance the property of textile. 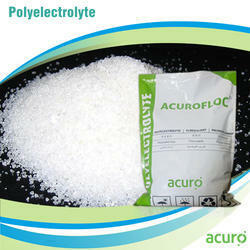 Polyelectrolytes are water soluble polymer carrying ionic charge along the polymer chain. Depending upon the charge, these polymers are anionic or cationic. Polyelectrolytes are available in a wide range of molecular weights and charge densities. Homo polymers of acrylamide are also included in the family of polyelectrolytes though they do not carry any charge. These are called nonionic. Polyelectrolytes have got a wide range of applications right from water purification, oil recovery, colour removal, paper making, mineral processing, etc. Polyelectrolytes are both flocculants as well as deflocculants depending upon the molecular weight. A flocculant is essentially a solid liquid separating agent while a deflocculant is a dispersing agent. 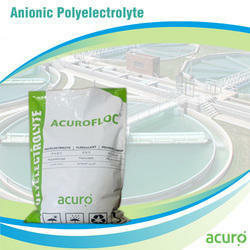 Anionic Polyelectrolyte Liquid is used for the same purpose as powder grade anionic polyelectrolytes. It can perform at the field both better or worse in view of wastewater character due to differences of copolymerization technics and polymer chain structure eventough both form has the same anionicity and equivalent molecular weight values. 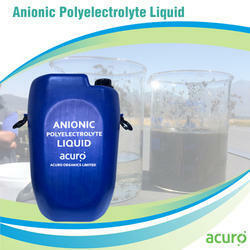 Liquid grade anionic polyelectrolytes are not only used as they supplied but also applicable as soluted in water. 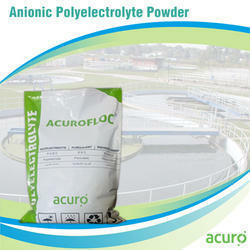 In comparison with powder grade anionic polyelectrolytes, liquid grade ones are more advantagous in terms of solution preparation time required. 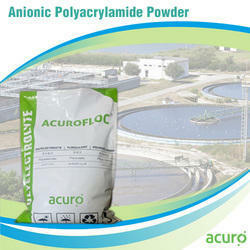 ACURO's range of high molecular weight polyacrylamides are anionic charged and are used for setteling of inorganic suspended solids in effluents water. Polyacrylamide finds use in diverse industries like textile, sugar, leather, mining, metal processing industries, etc. The dosage of high molecular weight polyacrylamides varies from 0.1-0.2 ppm. The exact dosage is ascertained through a jar test conducted in a laboratory. A stock solution is prepared by dissolving 0.1-0.2% of polyacrylamide powder in salt free water. This solution has to be stirred at 200-300 rpm for 20-40minutes. The stirring time can be reduced by using luke warm water. Polyacrylamide is packed in export worthy, heavy gauge 10kg Aluminium linied PP Bag Packing. 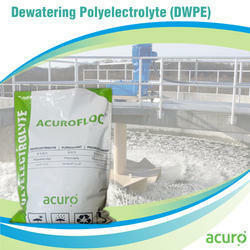 We are one of the leading manufacturers, suppliers and exporters of Dewatering Polyelectrolyte (DWPE), DWPE is a high molecular weight polyelectrolyte in powder form. It is used for dewatering of organic sludge from sewage, pharmacy biotechnology industry. The product is highly effective in dewatering of organic sludge from pharmacy effluent. Water Clarification - improves influent, process and effluent water quality by reducing suspended solids and turbidity.Dissolved Air Flotation - result in cleaner subnatants, increased float solids and greater throughput.Thickening - improved compaction, settling drainage and effluent quality.Filtration - improve filtered water quality and plant throughput. Handling Measures PrecautionsProper human safety products such as Splash goggles, lab coat, vapor respirator, gloves and boots should be worn while handling and applying chemicals. Splashes on skin should be washed off with water immediately. In case of splashing into the eyes, flush it with fresh water and obtain medical attention. Should not be injected. Please refer MSDS for more details. StorageThis product should be stored in original containers in cool and dry place, away from sources of heat, flame and direct sun light. PackingIt is available in 10kg/25kg bags. 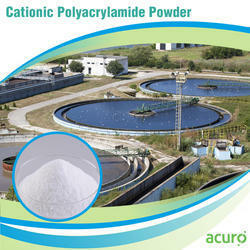 ACURO's cationic polyacrylamide powder (PAM) is used as a settling aid in industries that generate negatively charges effluent particles - like paper, food, coal, oil, aquatic product processing, fermentation industries and sewage treatment and industrial sludge dewatering processes. They are fluid form and liquid grade cationic polyelectrolytes and used for the same purpose with powder grade cationic polyelectrolytes. They can perform at the field both better or worse in comparison with different wastewater characters due to differences of copolymerization technics and polymer chain structure eventough both form has the same cationicity and equivalent molecular weight values. 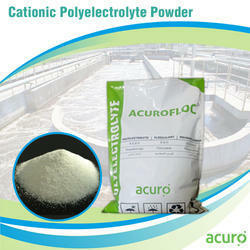 Liquid grade cationic polyelectrolytes are not only used as they supplied but also applicable as soluted in water. In comparison with powder grade cationic polyelectrolytes , liquid grade ones are more advantagous in terms of solution preparation time required. 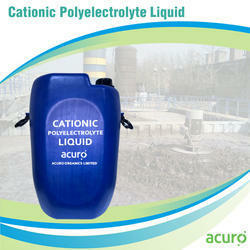 Cationic Polyelectrolyte Liquid is a organic cationic polymer used to remove oil and suspended soilds from water. It can be used alone or together with coagulants and flocculants such as iron salts, etc. It is suitable for use in air flotation separation, gravity settling and direct filtration. When used in conjunction with standards flocculants, it produces an excellent flock in treatment. ACURO's Poly dadmac is a strong cationic polymer that can settle suspended organic solids in waste water. Poly dadmac can be effective as a complete or partial replacement of PAC or alum. Poly dadmac works at very small dosage and forms large flocs which leads to rapid clarification. 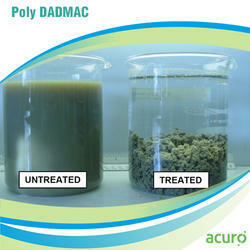 Acuro's Poly dadmac dosage varies from 0.04-0.6% depending on turbidity and TSS. Ideal dosage is calculated by conducting Jar test at laboratory level. Normal safety gear like goggles, gloves, face mask and protective clothing must be used while handling chemicals. Splashing of chemical on skin or eyes should be washed off with excess of water. Should not be ingested under any circumstances. Refer Acuro's product MSDS for further safety precautions and handling instructions. 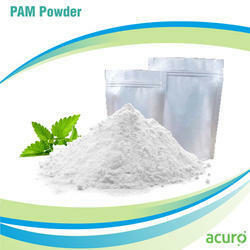 PAM Powder is typically dosed at 0.2-2.0ppm. Exact dosage is calculated in a lab through a Jar Test.